Organized by the Crown Heights Assembly - all the info you need is on the flyer. For those thinking about housing and development in the neighborhood, keep the April 16th Crow Hill Community Association meeting - which will feature presentations about the impending rezoning of Crown Heights West and landmarking efforts - on your radar as well. "Stop the Displacement of Black, Caribbean & Latino Crown Heights! Fix the Buildings! Show Us the Real Rent!" 1) Require landlords to meet all tenant demands on repairs and harassment. 2) Show legal rental histories to all potential tenants. 3) Charge and advertise only the legal rent. 4) Sever ties with landlords who have documented histories of tenant abuse. 5) Sign a legally binding contract ensuring implementation of these demands. On Saturday, long-term residents and new tenants alike will speak to conditions, rents, and the displacement of the Black and Caribbean communities in their MySpace-brokered buildings. One of these buildings – a microcosm of the negligent and malicious practices – has had so many violations it is currently listed in the city's Alternative Enforcement Program (AEP): HPD's annual list of the 200 worst buildings in New York. That hasn't prevented the building's new management company from evicting many of the building's Black tenants, renovating the vacant apartments, and bringing in new residents at high rents. Saturday's action is organized by the Crown Heights Assembly [CHA]. The march and rally will be CHA's second major mobilization in a campaign for tenant justice in buildings brokered by MySpace NYC. 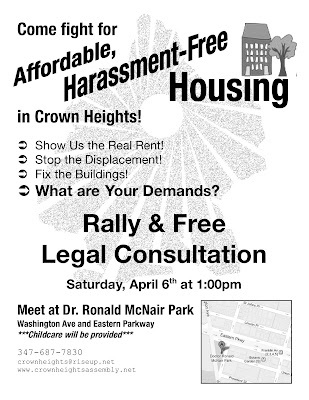 Saturday's event will also mark the release of a neighborhood bulletin on tenant justice in Crown Heights. CHA is building a coalition of long-term residents and new residents of Crown Heights on a foundation of solidarity and shared interest. Brokers and landlords are screwing both groups of tenants in different ways: forcing long-term residents out by refusing repairs, launching frivolous eviction proceedings, making repeated "offers" to buy them out for paltry sums of money -- and then bringing new residents to overcharge for the same apartments. We will unite and fight to end this cycle of displacement and overcharge. 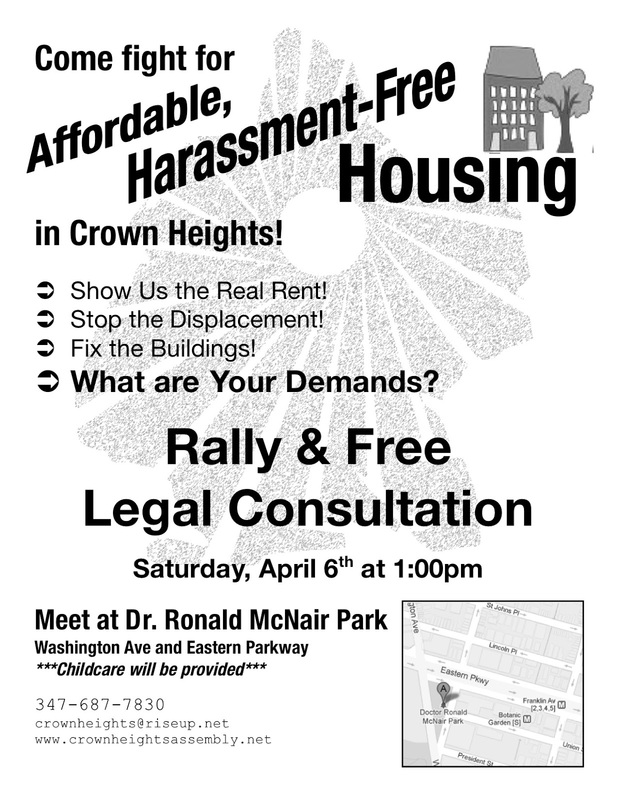 On Saturday, April 6, Crown Heights fights back – and we know that tenant justice will win. I wouldn’t mind publishing a post or elaborating on a number of the subjects you write in relation to here. Again, awesome weblog! SOS Crown Heights Talent Show TODAY!